Nothing. I know less about myself now than I did at 17- and that’s saying something. At 30 I thought I’d have it all together, not necessarily a house, kids and the husband to match, but at least that I could describe myself- really describe myself- in three words. Yup, still drawing a blank. So, as I sit here with my raw vegan mud cake and my matcha latte why not surmise what’s on my mind? I am in Canggu in Bali right now. After being the ‘always had a goal’ gal I decided to quit my great job working internationally in Bangkok and become a backpacker without any plans. Yup, oldest backpacker in the world. I’m still convinced that it is BAGpacker because all you do it pack and repack your bags! And don’t get me started on the packing process because I can’t even find my underwear never mind myself! I thought about going for an inspirational post: discuss my yoga and meditation, share the lessons from the healer I saw yesterday, reminisce about the calm I feel looking out over a cliff top…but this is not how it is flowing for me right now so I thought I’d attempt ‘funny’, feel free to criticise me if I fail miserably. The truth is I’ve had an opportunity to do yoga a million times a day and I’ve done it about five; I attempted to be a vegetarian but the chicken sate got me every time; I aimed to start every day with a morning jog and it has happened one and a half times (how does the half even happen? ); I saw a healer and my restless legs got me irritated; I gave up coffee only to become addicted to matcha lattes; I planned to blog every day and this is my first post in six weeks…find yourself FAIL. I have found myself (oh the irony!) wanting to scream because I don’t know who I am or what I want. Isn’t time away from everyone and everything supposed to bring clarity? Isn’t throwing off the shackles of a routine meant to bring a calm alertness to my mind? Isn’t all this chatter in my mind meant to ease with the soft blow of the wind through my sea swept hair? I love an inspirational quote, ask any of my friends, my Instagram feed is full of them, I drive my friends crazy on Facebook with yet another daily dose of inspiration. I can also talk the talk, giving good advice and words of wisdom (or so I’ve been told.) My problem? Not following through with my own words. I am my biggest critic and I often compare myself to my past self- teenage Claire who knew it all and genuinely didn’t care what people thought. Am I not supposed to be lost at 17 and found at 30? The constant wondering, the constant thinking, and the constant questioning. I need to just shut up. The truth is I don’t need to have a 5 year plan, heck I don’t even have a 5 week plan! I don’t need to have any of the answers because as I desperately search for them life is slowly passing me by, breath by breath. I need to remember: I am not looking for something, I am experiencing everything. So, there you are. I’m a metaphorical mess who needs to chill the chatter in my head by just doing things I enjoy and not wondering ‘where next?’ or ‘what next?’ or ‘who next?’ Because, my friends, the beauty of life is that we never know what is around the corner…so there is absolutely no point in looking. It is true what people say about the South Island: it is beautiful. The drive into Kaikoura from Picton was immense: towering cliffs, blue, blue water and an array of seals sprawled here, there and everywhere. Literally EVERYWHERE. The town is quaint with local pubs, cute cafés and boutique shops, the locals friendly. We travelled to Kaikoura to go dolphin and whale watching and it was wonderful: we saw hundreds of dusky dolphins and also humpback whales. Personally, I was on the lookout for orcas…a huge passion of mine and it is my dream to see them in the wild. This dream did not happen in New Zealand but fortunately it happened in San Juan Islands, Washington in the summer of this year- that blog will follow…it was a once in a lifetime experience. We managed to grab food in a pub next to our accommodation, this took some begging as they were about to close…I think it was the first time I’ve had a roast at 10pm! The next day we prayed for good weather and we were lucky enough to get some and so our helicopter and trek on Franz Josef continued. If you don’t have this on your bucket list then I suggest you do: the helicopter ride was such a thrill and the views were wonderful. The glacier is retreating so it is even more important to see this natural phenomenon before it disappears. My school Geography lessons came flooding back to me: scree, crevasse, fissure, moraine, blue ice and so on…oh the blue ice! They say that there’s no rest for the wicked so we must be very wicked as it was on to Wanaka we drove that afternoon. We slept well that night and explored Wanaka the next day. This exploration involved obligatory lake jumping shots and a free wine tasting session in Rippon vineyard. The designated driver then drove us to maginificent Queenstown where we met up with a good friend of mine from home who had recently moved to New Zealand. We stayed in her home overlooking Lake Hayes. Everywhere you look in New Zealand is breathtaking. That night we had delicious tapas in a lovely Spanish restaurant in Arrowtown and then went into Queenstown for a few drinks. Queenstown has lots of cute bars and intricate streets. It is quiet, well to me anyway, but that’s coming from Bangkok, it was a refreshing change. We even drank cocktails from teapots! The next day is something I like to call “The Best Day of my Life!” Well, one of them anyway. I turn thirty in December and I am following my friend’s great idea of making a ‘Thirty Before 30’ list. The biggest- and one of the most challenging- things on my list was to JUMP OUT OF A PLANE! I say challenging because I’m afraid of heights so what better way to overcome this fear and expand my consciousness than by jumping from a plane 15’000 feet in the air? And the experience in one word? Exhilarating. We then stuffed our faces with a famous Fergburger and mmmm was it delicious…more delicious than the underrated but potentially more scrumptious Devil Burger? I’m still undecided. That evening was spent chilling in, well you know, the HOT TUB! Our wonderful friend and hostess popped some bubbly and we relaxed and laughed and reminisced in the hot tub under the vast, vast sky of bright, bright stars. Pure bliss. Milford Sound was the plan for the next day and the drive down there was the best part about this trip- the sound itself was a little underwhelming but we had a great day nonetheless. We watched “Whale Rider” on the long journey back and I recommend you give it a watch if you get a chance. Queenstown was ended by reliving our youth with the Skyline Luge: think go-carts and zooming down a hill to this amazing view! Leaving behind the amazing time that was Queenstown was eased by the breathtaking drive to Akaroa. I have never seen such blue lakes, the azure of the water is unforgettable. It is also home to the smallest species of dolphin in the world: Hector dolphins. The calves are the size of a rugby ball and we managed to see one on our dolphin tour. The tour guide was very informative and the experience was amazing. The boat allows the dolphins to approach and play with it before the guests can get in the water with the dolphins (with many rules as to when and how we can get in.) We were given explicit instructions so as not to disturb the dolphins in the water. We had a dip with Hector dolphins rather than a swim as they are a lot more timid than the dusky dolphins of Kaikoura but still it was an amazing experience…even in the freezing waters! After another amazing experience in another amazing place, we headed to our final stop: Christchurch. Christchurch is still obviously hugely affected from the 2011 earthquake, you can see restoration and building work everywhere you look. However, it still has so much character. We met up with a friend from Christchurch who brought us to a few local bars that night: Strange & Co and Dux Central so it was good to see Christchurch through a local’s eyes. The next- and final day- of our adventure was spent exploring the street art of Christchurch and, like the restoration works, it is around every corner, literally. That, my friends, is South Island and it sums up my experiences in New Zealand: azure lakes, snowcapped mountains, huge whales, tiny dolphins, naughty alpacas, lazy seals, breathtaking sunsets, towering glaciers, wild white water rafting, geyser exploring, hobbit hunting, plane jumping, helicopter riding, bar hopping, street art finding, hot tub dipping, burger eating New Zealand. I spent the past week exploring a tiny portion of the amazing Philippines and out of the many wonderful experiences I had, I would like to share one unique one with you: The Moriones Festival. Being one of the only (predominately) Catholic countries in Asia, The Philippines goes all out for Easter. One place that exceeds all in bloody devotion is the town of San Fernando, located about an hour and a half from the capital Manila. On Good Friday, the 19th of April 2014 I encountered the Moriones. The event greeted me with a splatter of blood to my leg. 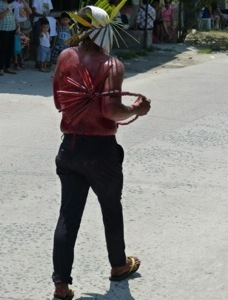 Masked men with wooden whips flagellate themselves as they march towards the focal point of the day: the place of the crucifixion. They walk for miles in the burning sun with bloody backs. Close family or friends even flog the devotees with some form of wooden object. We followed the route of the Moriones until we reached the place of the crucifixion; three tall wooden crosses stood tall on a hill and we battled our way through the crowds for a view of the reenactment. The crucifixion is reenacted using the Virgin Mary, soldiers and Jesus himself, several characters play Jesus. 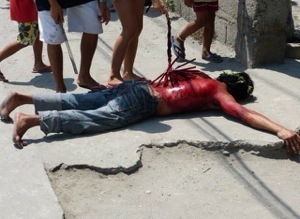 The devotees who pose as Jesus are nailed to the cross by their hands. 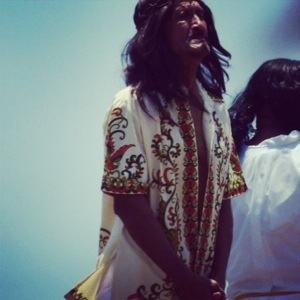 Ruben Enaje has carried out the role of Jesus twenty eight times…yes he has been nailed to the cross twenty eight times. Although not condoned by the Catholic Church, the devotion of the faithful was engraved on their faces. I feel blessed to have witnessed this event, this procession of faith.